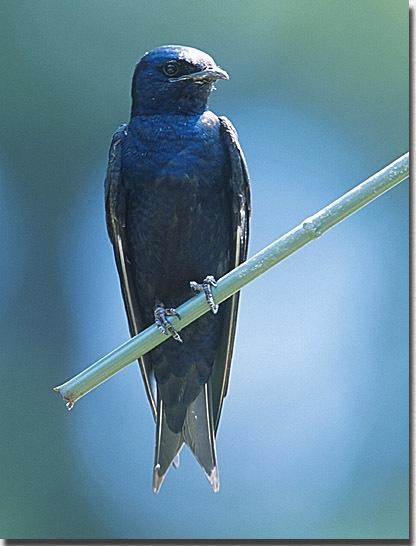 Purple martins are one of America's favorite birds. Their arrival each spring is a much heralded event in many backyards and their departure each fall marks the passing of another year for many. In the eastern U.S. purple martins nest almost exclusively in purple martin houses and gourds provided by man. In the west they nest more regularly in natural cavities. See this bird during a bargain holiday in the eastern part of the United States (spring or early summer) or on an exciting visit to their winter range in South America. In Oklahoma look for scouts to start arriving in late February to early March. Martins move north as the weather warms and insect populations start to increase so the arrival time will vary from year to year and from one part of the state to another.